WinnCompanies' Transformation of Historic Schoolhouse into Senior Housing Wins Charles L. Edson Tax Credit Excellence Award for Preservation from Affordable Housing Tax Credit Coalition in Washington, D.C.
Albany, NY (June 7, 2017) WinnCompanies, an award-winning national multifamily development and management company, is pleased to announce that Livingston School Apartments in Albany, New York has been honored the 23rd Annual Charles L. Edson Tax Credit Excellence Awards in the HUD Preservation category. We thank the Affordable Housing Tax Credit Coalition for recognizing our effort to transform the Livingston School on behalf of the Albany Housing Authority, said Gilbert Winn, CEO of WinnCompanies. We are proud to given new life to this beautiful structure, creating as community asset that delivers tax revenue and, most importantly, high quality affordable housing that contributes to social fabric and economic vitality of the neighborhood and the City of Albany. The $20.7 million adaptive reuse project transformed a 230,000-square-foot vacant former school into a 103-unit, mixed-income, independent living community for seniors. 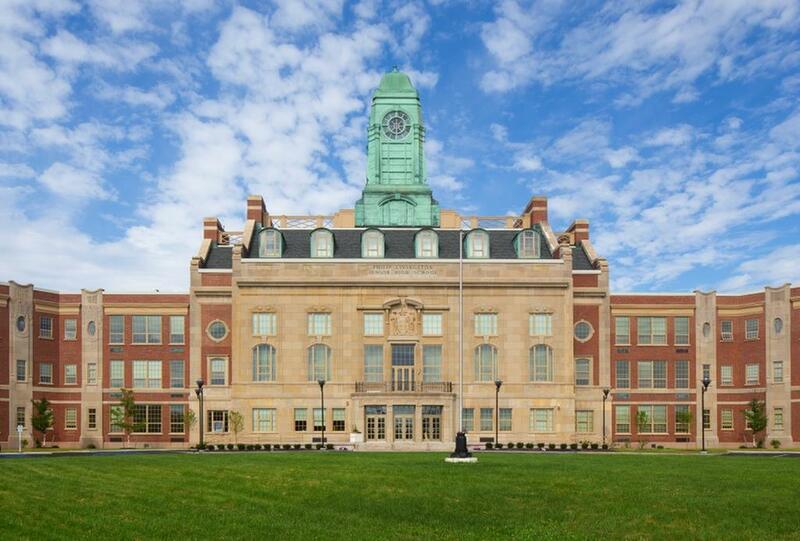 Throughout the development process, WinnCompanies took careful measures to preserve the historic integrity of the former Philip Livingston Magnet Academy, adding the structure to the National Register of Historic Places and utilizing original design elements such as the majestic clock tower and massive picture windows into the finished product. Given annually by the Affordable Housing Tax Credit Coalition, The Edson Awards are presented each year to the most outstanding Low-Income Housing Tax Credit (Housing Credit) developments in eight categories by the Affordable Housing Tax Credit Coalition. Members of Congress, businesses and organizations convene to celebrate Housing Credit developments that are creating stronger, healthier communities in urban, suburban and rural areas across the country. Each year, we come together for the Edson Awards to recognize and celebrate the Housing Credit's unique ability to improve lives, strengthen our communities and boost the economy. This year's winners remind us how vital the program is for cities like Albany and for America, said Anthony J. Alfieri, president of the Affordable Housing Tax Credit Coalition. The Housing Credit is America's primary source of funding for affordable housing, and as such must be expanded to ensure that more developments like Livingston School Apartments are possible. The historically-sensitive transformation utilized a vast array of public and private funding, including support from the City of Albany, the Albany Industrial Development Agency (IDA), the Albany Community Development Agency (ACDA), the New York State Division of Housing and Community Renewal (DHCR), the New York State Energy Research and Development Authority (NYSERDA), the New York State Historic Preservation Office (SHPO), and the U.S. National Park Service, KeyBank, Citizens Bank, Boston Financial, The Community Preservation Corporation and the Federal Home Loan Bank of Boston. WinnCompanies purchased the majestic structure in 2014 in response to a critical shortage of affordable housing in Albany and in 2015, delivered 103 units of vital housing for residents aged 55 and above, who earn 50%-90% of AMI. The renovation stayed on time and on budget and created 12 studio, 76 one-bedroom, and 15 two-bedroom apartments, with 11 handicapped-accessible units and five units equipped for the hearing or visually impaired. As a testament to the community's need for socially diverse, mixed income housing for active seniors, the Livingston School Apartments were fully occupied just two months after obtaining the certificate of occupancy. A panel of four judges selected eight first place winners and eight honorable mentions for this year's awards program. Livingston School Apartments was awarded honorable mention in the "HUD Preservation Properties" category. Given annually by the Affordable Housing Tax Credit Coalition, The Edson Awards are named for Charles L. Edson, an affordable housing luminary who was Transition Director for the U.S. Department of Housing and Urban Development (HUD) on President Carter's Transition Staff. Mr. Edson served in the Office of the General Counsel at HUD and served as Co-Editor-in-Chief of Housing and Development Reporter for nearly 40 years. He is a founding partner of the law firm Lane and Edson, and was later a partner of Nixon Peabody LLP.